superhero genre, by introducing costumed characters into all their ongoing sci-fi/monster comics. For some reason, Tales of Suspense lagged several months behind the others — most had ongoing hero features by the end of that summer, but it wasn't until the March, 1963 issue (which went on sale during December, 1962) that Iron Man was introduced in that title. That issue (#39) told the story of millionaire scientist/industrialist Anthony Stark, who was imprisoned by the North Vietnamese Commies and forced to create a weapon for them. Instead, he created a weapon for himself — a suit of high-tech armor, equipped with every useful weapon from laser beams in the fingertips to built-in jet propulsion, and used it to escape. Back in America, he continued using his armor to fight evil, adopting the name Iron Man. Stark explained the obvious close association between Iron Man and his business enterprises by claiming to have hired the superhero as his personal bodyguard. At first, "Bullethead" (as he was known in his early days — nowadays, they call him "Shellhead") actually looked like a walking pile of gray metal (as had Bozo the Robot, an earlier use of the concept), but his appearance quickly evolved into the shiny red and gold look he sports today. The character was created by writer/editor Stan Lee and artists Jack Kirby and Don Heck, Lee and Kirby being the ones who set the tone for most of Marvel comics during that period. Within a few months, however, Kirby had moved on and Heck, who had inked Kirby's work in the first story, took over. Lee and Heck handled the series together during its first few years, but many writers and artists have done it since. Six months after his first appearance, Iron Man, along with Thor, Ant Man, The Wasp, and The Hulk, became a founding member of The Avengers, Marvel's answer to DC's Justice League of America. In addition to the usual adventuring and villain bashing, he served that group as its first important source of funding. He has remained with The Avengers and its offshoots, off-and-on, ever since. He has also been affiliated with S.H.I.E.L.D., Marvel's late-'60s, superhero-oriented U.N.C.L.E. knock-off. In 1966, Iron Man joined several other Marvel characters, including Captain America and Sub-Mariner, in a half-hour animated TV series, produced by Grantray-Lawrence Studios (Rocket Robin Hood). These lackluster and poorly animated cartoons were faithful to the comic books they were based on, but have little else to recommend them. These, plus a couple of paperback novels, constitute his only appearances in story media outside of comics. Because of distribution problems, Marvel was limited in its comics production during most of the 1960s. In 1968, these problems were overcome, and the company immediately started launching new titles. That's when Iron Man left Tales of Suspense behind. He has been published in his own comic ever since. Marvel characters have always had personal problems, but in the 1980s, these began getting out of hand. 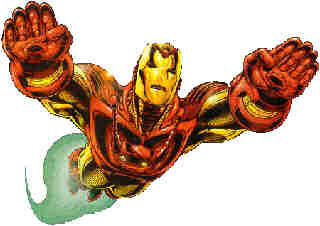 For Iron Man, they started with a couple of devastating bouts with alcoholism, and progressed through radical personality changes, to the point where even The Avengers, who have harbored several reformed (or apparently-so) super villains over the years, would have nothing to do with him. It's hard to recognize today's Iron Man as the dedicated, patriotic do-gooder he once was. But with superheroes these days, that's par for the course. Text ©2000-06 Donald D. Markstein. Art © Marvel Comics.